1 Blemished Available: $71.96 This item is available as a Blem/Refurb. These are items that cannot be sold as "New" merchandise and are limited to stock on hand. See the product details for a description of the product's condition. Love this helmet for summer riding. The built in sun visor and styling was the main reason why u purchased this helmet. I found though I normally wear a XL helmet with other brands and XL with this was way too large so I had to change to a L size which was just right. I found the inside warning label is wearing away extremely fast. I have only wore this helmet about 8 or 9 times and already it is wearing away and leaving residue on my backrest when I sit the helmet there, otherwise I love it! 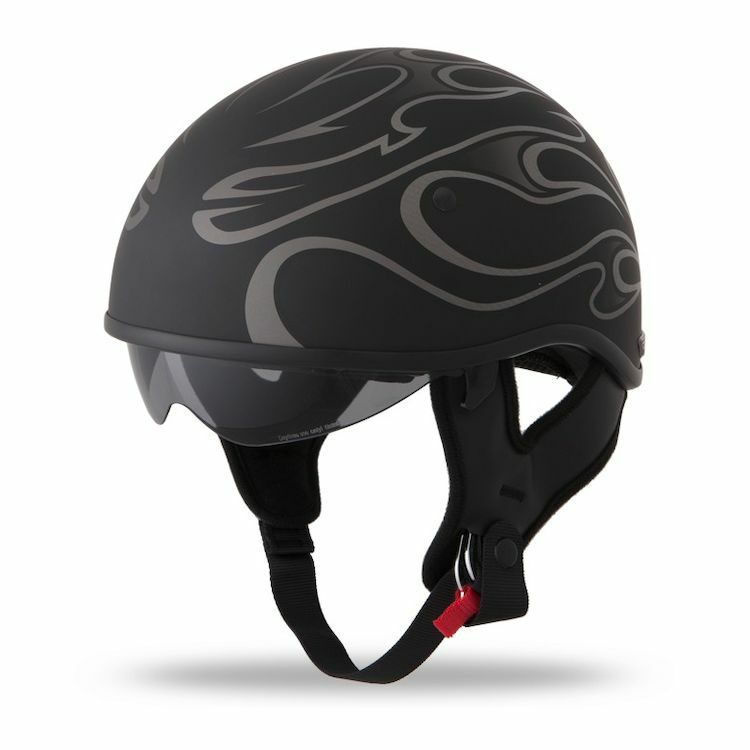 The plastic clip that is attached to the helmet lining carves into your forehead , if you have an oval shaped head. The manufaturer should review this feature to modify its design. This helmet is perfect for running the scooter around town. It looks great, has a great fit and very comfortable. I love the sunshade feature as it is easy to use and does what it is supposed to do. I would definitely buy another one of these helmets again and Revzilla is awesome to work with!! This is a very good product for a reasonable price. I think it will compliment my orange VTX quite nicely. More than just a plain black helmet without being too flashy. This seemed to be the best choice for my girlfriend. The others put here size, 21.5 in., right in between small and extra small. This one was spot on plus she wanted some sort of graphics but didn't want pink. I'll write a real review once it's here. Minimalistic size, drop down visor, sweet low-key flame graphics. 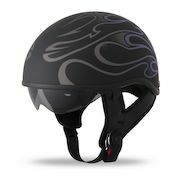 BEST ANSWER: Yes, the FLY .357 Flame helmet will cover the ears, however, comfortably. Also, note it runs small, suggest you go one size up. No, it will not cover the ears. BEST ANSWER: Yes. But it only comes with a tinted visor. BEST ANSWER: It's a matte black.